The Federal Highway Administration (FHWA) has published the Maintenance of Signs and Sign Supports guide to assist local road maintenance personnel in ensuring their signs are properly installed and maintained. More comprehensive standards and guidance on all roadway signing can be found in the Manual on Uniform Traffic Control Devices (MUTCD). U-channel sign posts have long been one of the most popular choices for displaying various traffic and property signs. U-channel sign supports are versatile and specifically designed to withstand rough use and weathering. This post type is often preferred for maintenance and light construction applications, since it is easy to install and maintain and is relatively low in cost. When installing a sign for the first time, technicians should be aware of the requirements for its location on the roadside. Signs are positioned longitudinally along the road, laterally from the edge of the road and vertically above the ground. When replacing an existing sign, workers should not assume the original sign was installed correctly. The location of the support and the mounting height of the sign should be checked to ensure the sign is visible and crashworthy. Refer to the MUTCD for detailed recommendations for sign height and location. Once you have determined the location for your sign, a key consideration is how deep the U-channel sign post should be driven into the ground. The depth depends on the length of the post. For example, a 4-foot sign post should be set 1.5 feet deep, while an 8 to 12-foot post should be driven 3.5 into the ground. Keep in mind that a damaged or broken sign post is easier to remove if it is not set into the ground more than 3.5 feet. One advantage of a U-channel sign post is that it can be installed directly into the ground without digging a hole. (The FWHA specifically stipulates that a U-channel post should be driven into the ground and not encased in concrete.) Simply mark the spot, hammer the post to the desired depth and use a level to make sure it is straight. The FHWA stipulates that sign supports within a designated distance from the roadway be either the breakaway type or shielded by a guardrail or barrier. The term “breakaway” describes sign supports that break or bend when struck by a vehicle. U-channel steel posts that weigh 3 pounds per foot or less automatically meet breakaway requirements. These posts should be buried no deeper than 42”, and installers should avoid using concrete to secure the base as this will interfere with breakaway functionality. 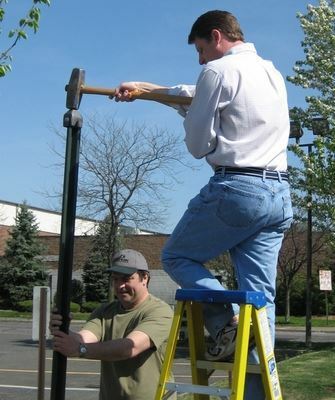 If heavier-weight posts are used, a breakaway device or system must be installed. These devices improve safety by separating on impact, reducing damage and making repairs easier and less expensive. Traffic Safety Direct’s Lap Splice Hardware is an economical breakaway system that is FHWA and AASHTD approved. It works with any size SP-80 U-Channel Post and is well suited for areas where signs experience repeated impact. Pre-drilled U-channel sign posts are designed to accommodate signs of all shapes and sizes. Sign mounting is quick and easy using our 2.5” Sign Mounting Hardware, which includes a standard Hex Head 5/16" stainless steel bolt, nut and lock washers that provide rust free protection. Simply place the sign on the U-Channel post according to your height requirement and line up the mounting holes with the holes on the post. Then secure the sign using the nuts and bolts. Although U-channel sign posts are simple to use and install, it is important to select the right sign support for the job in order to avoid visibility issues or serious injury resulting from a vehicle collision. 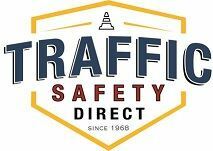 At Traffic Safety Direct, our experts will answer your u-channel post questions and help you make the best choice to meet your specific needs. Contact us today!